The Ferrari 458 is now shrinking violate, in fact it’s a bit of an animal, but that does not mean there is not a little room for improvement. Its time to go all VIP Design on you! Ferrari 458 Tuning UK: The Ferrari 458 is no shrinking violate, in fact it’s a bit of an animal, but that does not mean there is not a little room for improvement. Its time to go all VIP Design on you! Ferrari 458 Tuning UK : Is it time to go faster? On a normally aspirated car like the Ferrari 458, the tuning and software is not just about max BHP, it is what everyone wants to talk about of course, but its not where the action is. N/A engine tuning is all about 2 thing: Throttle response and availability of the power into the midrange RPM. The goal of the VIP Design Ferrari 458 tuning UK, is to make the throttle more responsive sooner, bring the power in sooner and keep pulling well into the midrange. 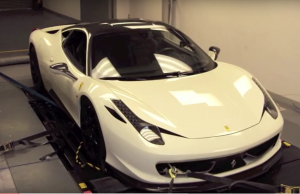 The VIP Ferrari 458 tuning and remapping is race track endurance tested. It will deliver every time. The full Ferrari 458 tuning UK and performance services are shown here fully fitted at our workshops, but if you can’t get to use we can arrange mail order shipping too. Where possible the tuning will be conducted live on our 4×4 rolling road, custom, tried, tested and delivered. UK wide collection and delivery is available if time is precious and you cant make it in to us. VIP Design can also offer a great range of carbon fibre Ferrari 458 styling parts, both exterior and interior carbon fibre is available, including door cards and dash parts. As well as spoilers, splitters and diffusers all fashioned from high quality carbon fibre.